Got an EMF Meter but don't know how to use it properly? Generally sensing your EMF exposure levels have become a problem? Or having a specific issue you need advice on? Wondering where to begin? Private home or small business consultations can often be made more EMF-safe even more simply, less expensively, and more conveniently now. with expert EMF help only a phone call away. 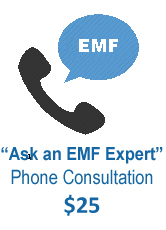 Request an EMF Consultation by Phone. You can start with our most popular, inexpensive and quick Ask An EMF Expert phone consultation to help you get started right away. With a phone consultation you can use your own EMF Meter and email us the results to discuss. You can also email us photos, floorplans, documents etc that will assist us to help you get the most of your phone consultation time and get started improving your personal EMF safety without delay. Whether by use of phone consultation or on-site consultation, we can help put in place the followup Remediation Services you need to confidently create an EMF-safe living or space with your optimal health and well-being in mind. Click here to request your time and date for a one-on-one phone consultation, with an EMF Expert. Simply use the convenient PayPal payment online and you'll receive an email confirming your consultation shortly. A quick $25 phone consultation may be all you really need. Or it could be the best way to get professional assurance you are on the right track. Or, it can be a good first assessment of the situation and in determining what kind of on-site professional help is needed. Either way, it is a great place to begin. With Do It Yourself Guides or "Consultation by eBook" you can purchase one of our inexpensive step by step user friendly EMF Remediation ebooks designed for the do-it-yourselfer in you to eliminate and remediate EMF in your home environment, beginning today with the most important room of all -- your EMF Free Bedroom Sleep Sanctuary -- which will have you sleeping better tonight! Another example, our most popular ebook for DIY enthusiasts, "EMF Meter Know How", will help you save hundreds of dollars, walking you step by step through measuring your own EMF environment, beginning with instructions on selecting the right EMF Meter and understanding how to use it accurately. If you're concerned that your home may have high levels of EMFs an EMF meter can help you to find out for sure, and intervene as soon as you can. At the same time you can take the steps necessary to better understand this dangerous, insidious, invisible environmental pollution. Whether you are looking for an EMF Meter Assessment with Private On Site EMF Consultation, or Phone Consultation, or DYI Support, we can help you to reduce your family's in-home EMF exposure significantly right then. We're also experts in Industrial EMF Compliance Inspection. Using a proprietary methodology designed in conjunction with some of North America's leading EMF scientists and experts, the consultants from EMF Experts can survey for and then provide a remediation plan to eliminate or reduce much of the harmful EMF energy in your home, thus reducing your ongoing exposure to its damaging effects. We can accurately test the EMF in your environment with your goals in mind and provide you with a written report. 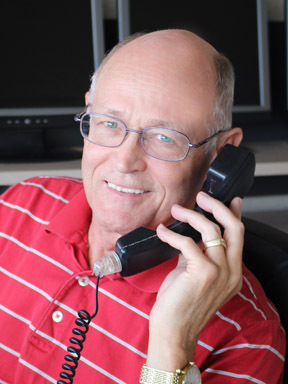 Like Phone Consultations, our On Site Consultations are $75 USD by the half hour. Travel outside of the Tucson area will be billed at the same rate for time plus mileage charges at the standard federal rate of reimbursement. Electromagnetic fields - Using a Gauss meter and other scientific instruments we can find 60HZ EMFs in your electrical system that are primarily caused by damaged or poorly installed wiring that can create dangerous magnetic field "hot spots" in a home. Stray current on plumbing, wiring and grounding errors are more common than one would expect, especially in older homes, and entirely correctable. High-voltage lines, power lines and common items such as transformers, laptops and computers, CRT monitors, energy-efficient lighting and power cords can also produce strong electric and magnetic fields. Let us show you how to minimize the risk these devices pose to you and your family. Radio frequency (RF) - This type of EMF is produced primarily by wireless devices and cell towers and travels through the air. We'll measure for RF being emitted by near-by cell towers and from the new, popular "always on" DECT cordless phones, now banned in schools in parts of Europe. We'll also look for EMF sources located in and outside your home, things such as pulsing cordless phones, wireless networks and PDAs. Dirty Electricity - Using a special meter we can measure for a low frequency EMF called "Dirty Electricity" that may be contaminating your home's electrical wiring. Dirty electricity has been on the rise as we continue to add electronics and energy efficient lighting and electrical devices to our household grids. Many things in a modern home create this type of dangerous high frequency EMF including dimmer switches, computers, treadmills, TVs and entertainment systems, energy-efficient lighting and virtually all modern electronic devices. The EMF created by Dirty Electricity radiates several feet into a room, even when the electricity is not being used. Reserve your copy of our new manual on using meters to identify the EMF in your environment. See the preview here: "How to use meters to measure EMF"
Understanding EMFs can be difficult. After your home inspection our consultants will supply you with the latest scientific data concerning EMFs. They'll explain to you how EMFs are produced, how they impact your health and how you can avoid or eliminate exposure. Plus, you'll also get a comprehensive list of important common-sense suggestions to help you reduce your ongoing exposure to this dangerous, new environmental toxin while at home, school and in the workplace. After your EMF home inspection our knowledgeable consultants will discuss with you the options available to lower the levels of dangerous Dirty Electricity, RF emissions and other EMFs in your residential living environment, office space, or emanating into your environment from external cell towers, power lines, and more. You'll receive a detailed report showing you where all the dangerous levels of EMF "energy" are located in your home - so you practice "prudent avoidance" and we can take immediate action if required. Other corrective measures may be required where electricians or other outside contractors or the utility company may need be called in to deal with the problem. All of these areas will be covered in your comprehensive EMF home inspection report. Looking for an EMF Professional in your area? Peruse our Directory of Certified EMF Expert graduates and other professionals across the country and around the world. We may have trained one right in your neighborhood. Interested in becoming a certified EMF Expert yourself? We are proud to be the people who train and certify EMF Experts, Consultants and Professionals worldwide. Wondering what your EMF Consultant Business might look like? Find out what our Certified EMF Expert graduates are doing in their businesses and what interesting income areas they are expanding into - from Feng Shui, to green living, to health consulting.